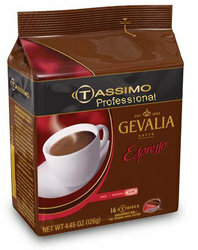 Gevalia Espresso Tassimo Professional "T" Discs. The secret behind so many drinks is a good, solid espresso. The Gevalia Espresso discs deliver! The secret is that the Tassimo Pro machine was built with espresso in mind. The bar coded discs tell the machine to run a fully functional espresso routing, complete with pressure. Simply amazing! Note: Tassimo Pro discs will not work with Tassimo Home brewers, and vice versa. Tassimo Professional products are for commercial espresso service applications only. These products can only be sold and used in conjunction with Tassimo Professional obtained through us in Metro Atlanta, Ga.